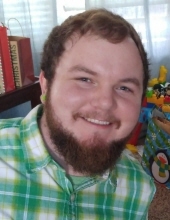 Benjamin R. Rohland, 26, of Eau Claire, WI died June 10, 2018 at University of Wisconsin Hospital in Madison, WI. Born leap day, 2-29-92, to Dave Rohland and Kathy (Haugen) Rohland, Ben joined his ancestral angels on June 10, 2018. That included his grandparents, Don & Joanne Haugen, Rhinehart & Audrey Rohland, and other loved family members. Ben was a joyful person who did not really enjoy hunting or fishing but enjoyed target shooting, camping, skipping stones (especially at Lake Superior), helping a turtle cross the road and rescuing a bat or spider from the house. Although sports were not his favorite hobby, Ben played baseball, soccer, football, and tennis more for the camaraderie not the win. He loved family board games, bean bags and bowling. The competition was strong during these events because the losers did the dishes! His family saw the kind, compassionate, unconditional, loving young man that he was and as the stories came in from friends, co-workers, and places he frequented, we were proud of the depth and distance of how many people he touched. Computers, gaming, and design were his passion. He was enrolled at CVTC and found his “tribe” in his teachers and classmates there. He was the club treasurer and was enthusiastically involved in the club’s potlucks, games and outings. Those classmates and club members encountered the silly, the spontaneous goofiness, and the genuine love of Ben that his family also appreciated. Celebration of life for Ben (Benny) Rohland will be held on Friday June 22 from 3pm-7pm at the Lake Altoona county park clubhouse. Remembrance service 4pm-5pm lead by Mick Humbert with family and friends sharing memories they have of Ben. Please join the family from 5pm-7pm celebrating Ben in enjoying some of his favorite foods and games. "Email Address" would like to share the life celebration of Benjamin Rhinehart Rohland. Click on the "link" to go to share a favorite memory or leave a condolence message for the family.